I don’t remember much from when Claire was a baby. It was a pretty chaotic period in my life. If I strain to think I remember her giggles when she naked crawled lightening fast after a bath. I know that she used her hands, we have pictures of her drinking from a cup on her own. I remember a few things but not much. I know that I was sick and Jared and I were in separate states for a long period during the last few months of her ‘typically developing’ time and that is what I remember the most. Laying on the couch with a fever, watching her play with her toys. As the story goes, slowly that all changed. I have a lot of regrets about that time, I wish that I had been more present and that I had made choices that spread me less thin but there is no going back. Fast forward to last week. The highs were so high, the lows so low. 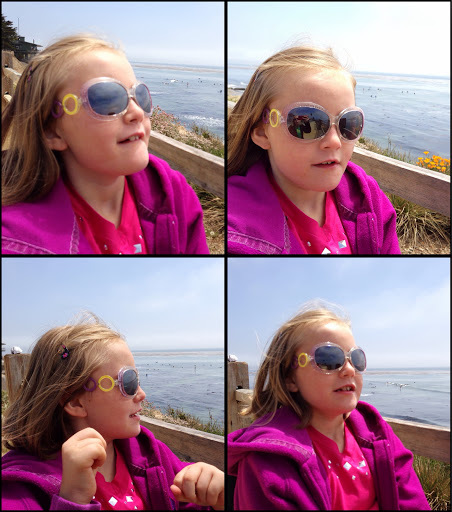 Claire slipped into a scary cycle of seizures and sadness that left my mind reeling. Was this the new normal? Can she sense something about her body that I can’t tell? Is she alright? Will she loose her ability to chew and need a tube? Will she wake up in the morning? After two long days in that world, on Friday morning she woke up and was back to her lovely, wonderful self. I lingered at the drop off for school, I kept talking to her, watching for her to smile appropriately and raise her eyebrows to express her annoyance with me not leaving. Of coarse she did, but I hesitated, it was hard to leave. I worried that I would come back to pick her up and she would be asleep, unable to hold her head up after a bout of seizures. Since then she has continued to be herself and I have tried to soak it in as much as I can. I caught myself taking a ridiculous number of pictures of her today as she smiled that smile that said so clearly that everything was right in the world. She’s fast, it’s hard to catch with a camera but will knock you off your feet if you are with her. I wanted to get a picture of it so badly because I didn’t know when or if I would see it again. I am self aware enough to know that this ins’t good thinking, that and the chest pains I had were a sure fire indicator that stress levels were too high. I called a friend who is on the other side, she knows what it is like to not be able to see that smile again. Her sons life was taken too soon from brain cancer. I told her of my fear, how I try to my the most out of every good moment, how I don’t want to miss a thing. Her response was perfect, it set me free. The short version of what she explained is that if Claire dies I will be so torn that it won’t matter, there’s nothing that can be done today that can ease the pain and that I am doing a good job today. It was such a good reminder, today is all that I have. I know that Claire wants to be average more than anything, which might even mean her mom forgetting stuff and missing some details because that is what life is made of, not just the big smiles at the beach. There is no amount of extra hugs or special moments that will change that reality if that day ever comes. The best that I can do is to simply be, happy, sad or indifferent, it isn’t time wasted, it’s time spent honestly.